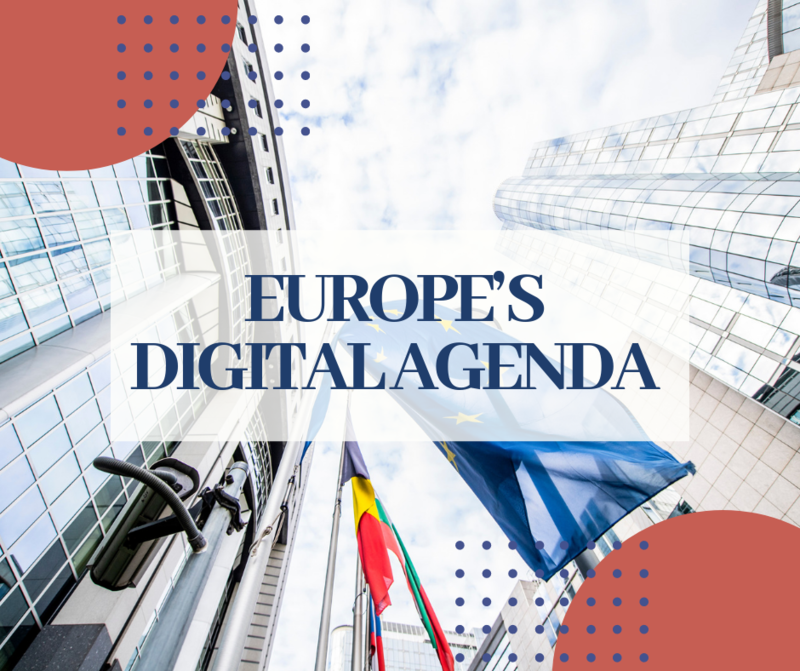 Welcome to the first edition of Europe’s Digital Agenda weekly summary. In this space I will try to uncover and detail the last week’s European digital agenda, highlighting the most relevant news and events. The article will present the latest developments in key areas of European digital affairs, Brexit, EU institutions’ forthcoming activities, digital movers and shakers and AI funding opportunities. This week saw a packed programme for committee meetings, workshops and other events that signaled the start of a new European parliamentary term. Austria took over the Presidency of the Council of the European Union in July, and immediately faced a series of hurdles, both on the European continent and beyond. The new presidency has announced its intention to focus on security and the fight against illegal migration, as well as promoting digitalisation across the member states. The Presidency’s motto is ‘A Europe that protects’. In order to achieve this objective, Austria’s approach will be based on enhancing the principle of subsidiarity, meaning the EU is expected to focus on big issues which require a joint solution and take a step back when it comes to smaller issues where member states or regions are in a better position to take decisions. The House of Commons Brexit committee is in Brussels today for a private meeting with Michel Barnier. It seems Brussels is considering giving British PM Theresa May a standalone Brexit Summit in November, as the October Council Summit deadline for an EU-UK withdrawal agreement approaches and progress on the negotiation seems to be stalling. EU officials are also considering a standalone Brexit meeting in November as this October Council Summit’s agenda seems already filled with migrations, defence and international trade issues. If a deal can be done, it is likely to happen at this special one-off summit. Last week, the UK Brexit secretary Dominic Raab published the first no deal planning papers telling businesses and organisations what they need to do to get ready for the possibility of a no deal Brexit scenario. While cabinet ministers say that a deal is the most likely outcome, the government decided to publish a 25 documents of guidance for people and businesses across a variety of areas to try to avoid the “short-term disruption” which it admits is possible if the two sides cannot reach a deal. European Investment Bank awards £450m to Nokia for 5G development. EU calls for applications for an expert group on Business-to-Government data sharing. The European Commission has announced its intention to set up an Expert Group on access to and re-use of private sector data for public interest purposes, bringing together independent experts to discuss business-to-government (B2G) data-sharing principles and to provide advice on future policy and funding initiatives. You can submit your application online via EU Survey. The deadline for applications is 28 September 2018. Agency for Digital Italy (AgID), Teresa Alvaro named new director. Teresa Alvaro, the director of innovation technologies of the Italian Customs and Monopolies Agency, has been nominated as director of the Agency for Digital Italy (AgID). The main purpose of the agency is to guarantee the achievement of the Italian digital agenda objectives and contribute to the diffusion of information and communication technologies, with the aim of fostering innovation and economic growth. Mrs Alvaro was chosen by the Italian minister for Public Administration Giulia Bongiorno among 74 candidates examined. Alvaro takes the place of Antonio Samaritani, who left the post in July. UK Government to spend £92m on ‘study’ for go-it-alone post Brexit Galileo alternative. The government is to invest £92m of public money on a study weighing up how to develop the UK’s own satellite navigation system to replicate the EU’s Galileo system. UK Government outlines no-deal Brexit plans. The Brexit secretary Dominic Raab has published the first no deal planning papers telling businesses and organisations what they need to do to get ready for the possibility of a no deal Brexit scenario. Estonia has become the 21st European country to sign the European declaration on high-performance computing (HPC). 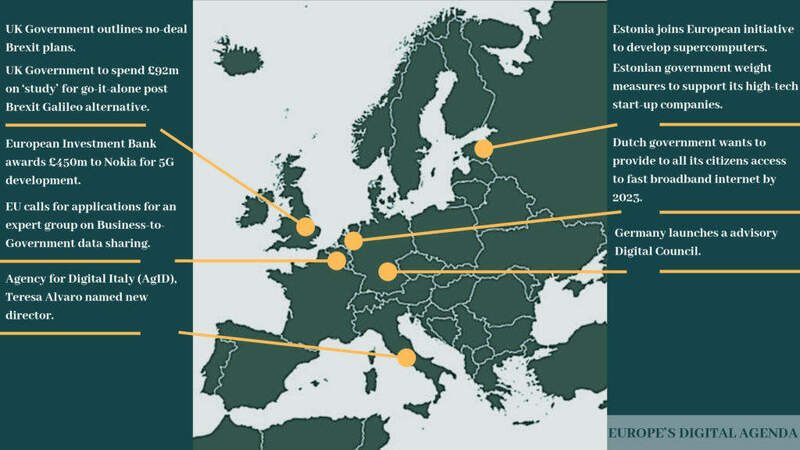 The aim is to pool European and national resources to build and deploy world-class supercomputers that would be ranked in the world’s top three by 2022-2023. Estonian government weight measures to support its high-tech start-up companies. The Economic Development Committee of the Estonian government discussed the creation of a support measure for high-tech start-up companies, which would provide an opportunity to increase the number of Estonian start-ups and facilitate their entry into the international market. Over the past ten years, Estonian start-ups attracted £800m in investments, of which 90% were foreign investments. The Digital Council will be responsible for advising the German government on digital transformation issues. Its ten members come from the academia, research and the private sector and bring to the team a wide range of experience. The body of experts will be chaired by Katrin Suder from the Hertie School of Governance. The Information Commissioner’s Office has fined Lifecycle Marketing (Mother and Baby) Ltd, £140k for illegally collecting and selling personal information belonging to more than one million people. The data was used by the Labour Party to target new mums in the 2017 election. The Dutch government has set a goal of providing all Dutch citizens with access to fast fixed-connection broadband internet (at least 100 megabits per second) by 2023. Currently, 97% of Dutch citizens have access to fast internet via a fixed broadband connection. The Dutch Ministry of Economic Affairs and Climate Policy said it will soon issue an umbrella scheme to make it easier for local authorities in rural areas to provide financial support for construction of fixed broadband facilities. This will mean that Dutch local authorities will no longer need to submit individual financial assistance schemes to the European Commission for broadband development. – Nic Harrison, director of service design and assurance at the UK Government Digital Service (GDS) is to leave his post and return to work with the Department for Work and Pensions (DWP). – Teresa Alvaro, the director of innovation technologies of the Italian Customs and Monopolies Agency, has been nominated director of the Digital Italy Agency (AgID). – Liam Maxwell, UK government’s first national technology adviser, is off to work for Amazon Web Services (AWS). – Katrin Suder is to chair the German government’s new digital council. In this function she will advise the Merkel’s government on how to bring digital transformation to the country. – Chandler Wilson, former EPP and Commission’s adviser, is set to become head of data innovation at HSBC in London. – The head of the European External Action Service’s cyber-diplomacy team, Heli Tiirmaa-Klaar, has been named Estonia’s new “Ambassador at Large for Cybersecurity” starting on September. – Larisa Pircalabelu is leaving Aspect Consulting to join Ericsson as director of European affairs, government and industry relations. – Patrick Curry replaces Natalie Black as the deputy head of PM Theresa May’s policy unit. The Norwegian National Civil Protection Administration (Oslo, Norway) has issued a £54m (€60m) tender to procure a new collaboration partner for the management (with an option for operation) and further development of the guardianship application (Vera), which is the case processing system for guardianship cases. The tenderer will, amongst other things, have overall responsibility for maintaining and further developing the different modules included in Vera, particularly with a view to the optimisation and further development of the application and the use of new technology such as RPA, automation and artificial intelligence. The Italian council of Monserrato has issued a £276k (€308k) tender to procure a network of intelligent street lamps able to detect the sound of traffic accidents, and a prototype of an AI platform that will be able to analyse data from video and traffic situation to enhance road safety. The European Defence Agency (Belgium-Brussels) has issued a £153k (€170k) tender for an Artificial Intelligence and Big Data for Decision Making exercise in C4ISR– ABIDE.